In Morocco, a traditional Jewish groom would wear a white shroud under his black groom’s coat. In Yemen, a Jewish woman would receive female guests on the first Sabbath after she had given birth, wearing a regal dress adorned with pearls—a dress she would then wear on Yom Kippur and eventually be buried in. This keen awareness of the life cycle and of human mortality is one of the themes of Dress Codes: Revealing the Jewish Wardrobe, an exhibition that opened March 11 at the Israel Museum, Jerusalem. On display are some 100 items, covering about 250 years and originating in nearly 30 countries. The exhibits, all of them worn by Jews, are but a small part of the museum’s collection of 10,000 items of costume, according to Efrat Assaf-Shapira, who is making her curatorial debut with this exhibition. Jewish women in traditional communities around the world generally wore clothing that men deemed modest. But definitions of modesty varied and were influenced by the surrounding culture. Thus, long before the Taliban came around, Jewish women in Afghanistan wore a black chader with a full-face white veil, and in Iraq both Jewish and Muslim women wore a body wrap called an and a full-face veil made of hair from a horse’s tail. 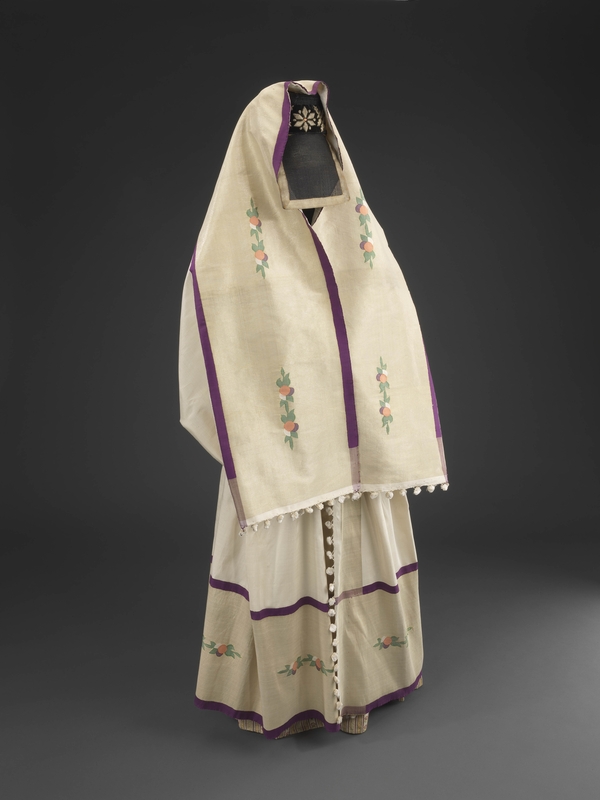 The manufacturer of these horsehair veils was a Jew, as were many of the people who worked in the textile industry. These garments—symbols of the vise-like grip of patriarchal societies—send chills up my spine. Yet there are women in Israel today, known as “Shawl Women,” who have adopted coverings that are as concealing as any in this exhibition. Oddly, there is a feminist aspect to their super-piety, because they are acting on their own accord, without the sanction of (male) rabbis. Traditionally, women could at least please themselves in what they wore under their wraps. “Concealing and revealing” is another of the themes of the exhibition, Assaf-Shapira said, pointing to the brightly colored trousers worn by Bukharan women under their whole-body cover-ups. And in Baghdad, the curator added, women wore sequined and embroidered bustiers hardly different from what Jean Paul Gaultier designed for Madonna. 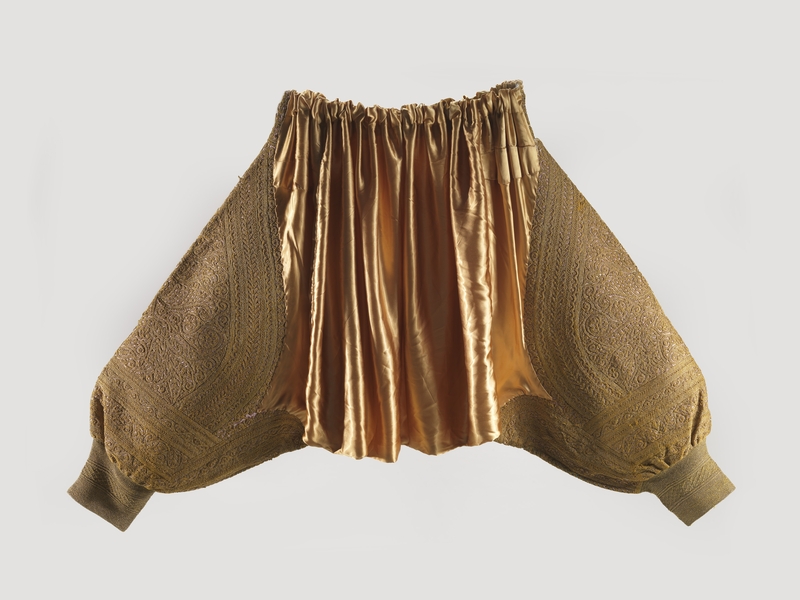 One of the oddest items on display is a pair of trousers, part of the bridal costume in Tunisia. The trousers appear to be size XXXL, and the explanation is that women were fattened up—even awakened at night to eat—before the wedding, because bodily fat was considered a sign of good health. Another very interesting, and rare, item is from Iran. Dating to the early twentieth century, it is all in maroon, and consists of a jacket, a short tutu-like skirt, and tight pants. Assaf-Shapira said the fashion was influenced by the visit of the shah and his wife to Paris, where they saw a ballet and were captivated by the tutus and tights. But the fashion was short-lived, because Iran at the time was moving rapidly toward the West. As is obvious from the exhibition, brides did not always wear white. In fact, most of the bridal costumes displayed are in other colors. It was Queen Victoria who made white de rigueur for bridal gowns. On display is a magnificent mid twentieth century ivory gown from New York; the “something borrowed” is the fine, nineteenth-century lace veil, and the “something blue,” Assaf-Shapira revealed, is a blue ribbon tucked inside the bodice. In traditional Jewish communities, a treasured dress that did not become a shroud might be donated to the synagogue after the owner’s death for use as a parochet (a cover for the ark). The cover would then be embroidered with the woman’s name, thus serving as a memorial for her. Also on display is a collection of children’s clothes—nearly all of them looking like miniatures of adults clothes, because in traditional societies children were considered to be adults in the making. Text copyright 2014 by Esther Hecht. No part of the text may be used without written permission of the author, or, in the case of the images, written permission of the Israel Museum.